Preparation: Bring salt and flour, or do your taste test with salted and unsalted chips. Jesus once told his disciples that they were salt and light. That was sort of a strange thing to say. What do you suppose Jesus meant by that? Jesus told his disciples, “You are the salt of the earth. But what good is salt if it has lost its flavor? Can you make it useful again? It will be thrown out and trampled underfoot as useless” (Matt 5:13 NLT). In other words, without its strong taste, salt is not much good for anything. Could I have a volunteer to taste something for me? (Choose a child to try a flour and salt taste test.) I’m going to pour a white powder into your hand. You taste it and tell me if you think it is salt or not. (Put a pinch of white flour into the child’s hand.) Does that taste like salt? (Child can describe the taste.) It doesn’t have much of a taste, does it? It’s bland and plain. Would you put it on your food? Now I want you to taste something else. (Put a pinch of salt into child’s hand; it can be ground to a powder to resemble flour.) Does that have a strong taste? What is it? (Child responds.) That’s salty salt. We put salt on food to flavor it. If our salt was not salty, it would be useless to put it on our food. A little bit of salt on food can make a big difference. One little light can push back the darkness. Just a few salty Christians in a neighborhood can make a difference. Followers of Jesus can change entire neighborhoods, whole societies, even a country. 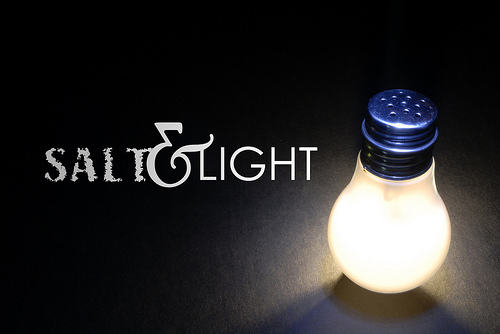 You are the salt of the earth and the light of the world, so be salty and shine brightly and give glory to God! Prayer: Help us to be salty Christians, Lord. May we shine brightly in our world and show others the way to you.